Five Guys. Better Than Shake Shack. Ok, ok – I’ll confess. So far, I’ve had nothing but bad experiences with Five Guys. But so many people say it’s the best damn burger, and its reputation is so touted, I constantly decide to give it second (and third, and fourth) chances. 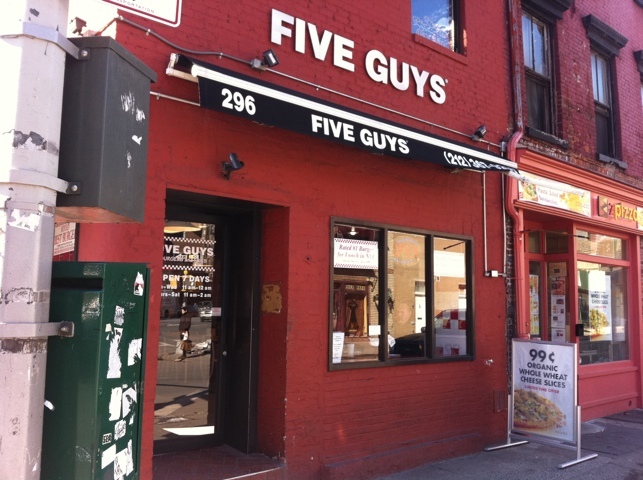 Five Guys in the Village. The ugly, eyesore, headache-inducing interior. Why do you suppose they insist on making the interior the visual representation of hangover pain? I don’t know. But they do. 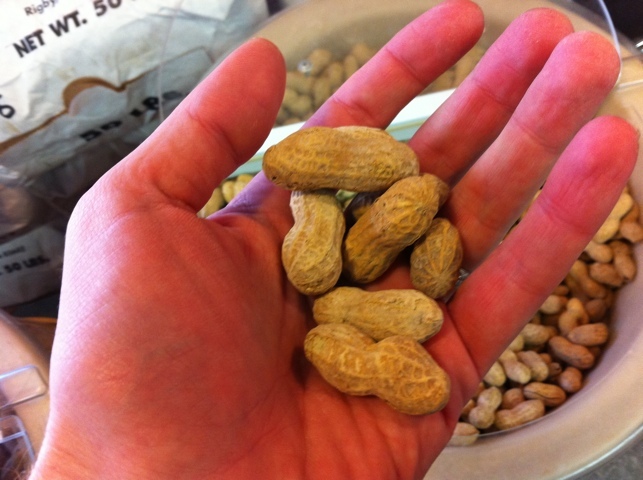 That said, one thing I LOVE about Five Guys is the free peanuts in the shell. Behind my hand above you can see the vast keg of peanuts they have sitting out. Patrons can feel free to load up. Who doesn’t love peanuts in the shell? I mean they are wonderful. 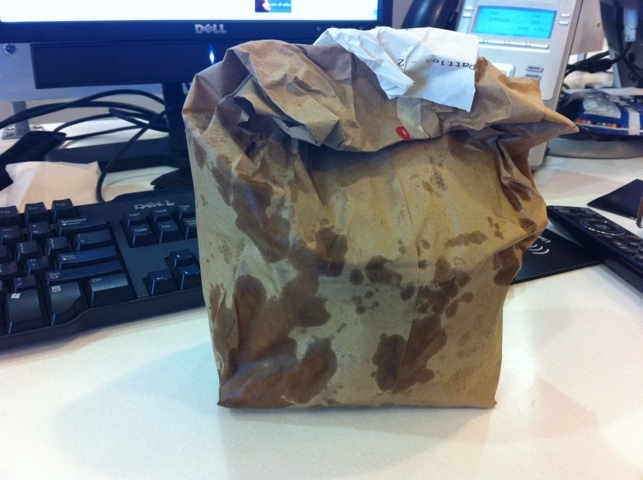 I got my food and hastily returned to my office. Despite the bitter cold, the food was still warm five minutes later when I got back to my desk. The greasy spots you see above are chiefly because of the overload of fries they give you in an order. I’ll describe their quality momentarily. The fries. Half of the overflowing cupful spilled greasily into the bag. The fries were pretty damn good. They are fresh cut, thick and fried up nicely. These had a crisp bark but a mushy, potato interior which strengthened my experience. 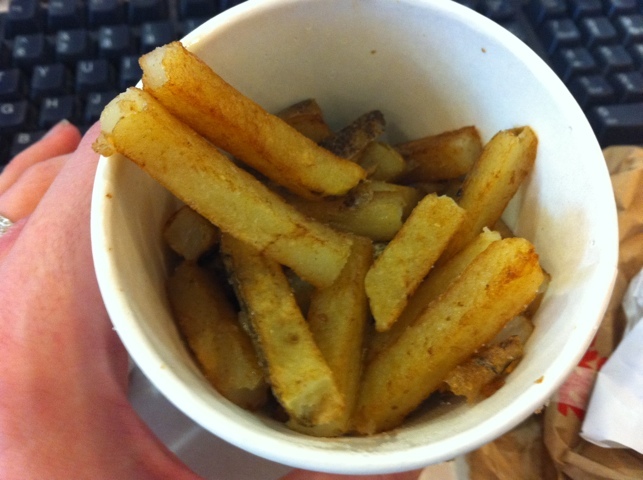 There were so many, I shared them with a colleague who apparently adores Five Guys. Her line: my fries were mushier than usual. That said, I was pleased. Guess what? This time, the burger was actually ok. It was the first time I had a burger from them that even seemed like something I might speak well about. I order mine with lettuce, tomato, onion, light ketchup and light mayo. 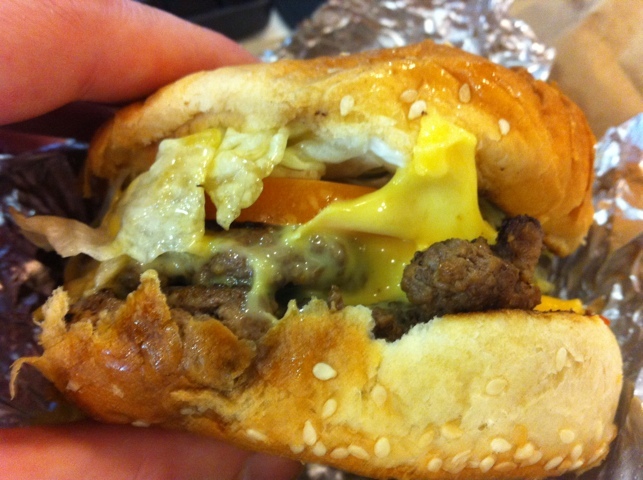 As you might be able to make out, the burger from Five Guys is actually two patties stacked atop each other. Honorable mention, by the way, to the bun, which was sesame seeded and pretty tasty, in a devil white flour sort of way. It swiftly degenerated into a soft smushy glob. Well done, but not done well enough. As you can see, the meat comes out well done. 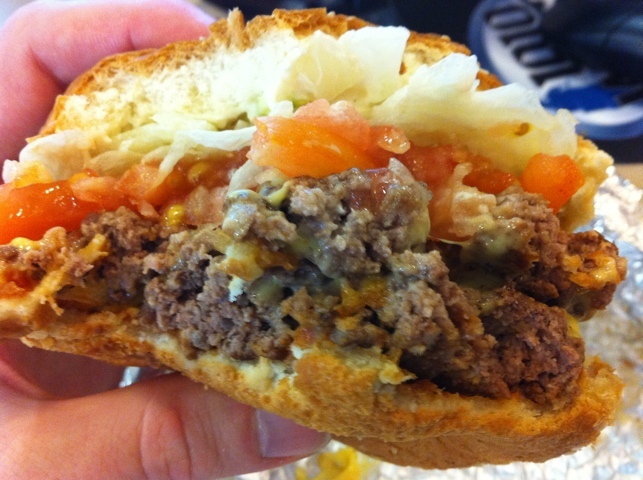 There’s enough beef with the two patties to make a rounder burger on the order of Best Burger. But they don’t. There’s a good salt note, and the burger as such is suitably beefy. All in all, I found it preferable to the Shake Shack burger, which to this day I still don’t understand. 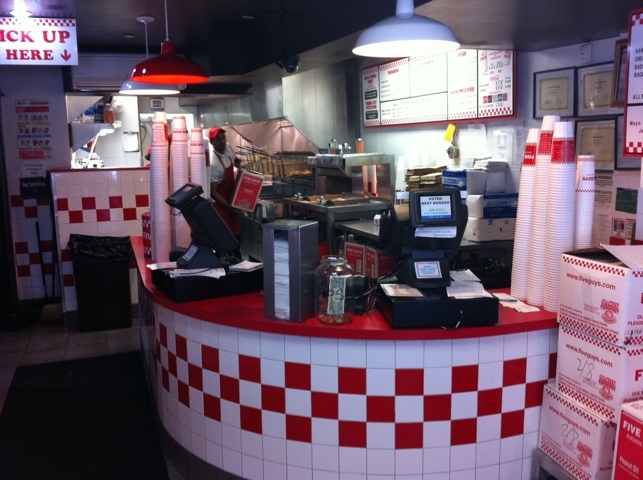 My experience was possibly redemptive of previous negative experiences at other Five Guys. Enough to convince me to be open about trying them again. In the final analysis, I’d say it’s better than Shake Shack, but nothing spectacular, and not up to the Parker Meridien burger, let alone other major players. I think maybe Bill’s is better, but this wasn’t that bad. I’ll revisit. For the record, it’s no Mel’s.